The gap of 5 years between the first 2 films, Koyaanisqatsi and Powaqqatsi, does not seem too unusual but it was to be a further 14 years before the "Qatsi" trilogy was completed with the film "Naqoyqatsi". This word can be translated as "Life as War" or "War as a Way of Life" though the focus of the film is not solely upon war as such. 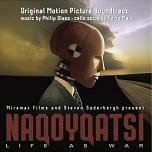 Rather Naqoyqatsi looks at the impact of technology in different aspects of modern life including war. The style of the film is different from its prequels due to the almost constant use of visual effects. The capabilities of those effects have progressed significantly during the 14-year gap, and they act as a new dimension of commentary on the underlying images and are sometimes used to generate digital images directly. The irony of using technology to comment on man's use of technology is not lost on filmmaker Godfrey Reggio. However composer Philip Glass felt that the powerful nature of these effects and the resulting alienation of the viewer from the events depicted, required some degree of balancing to humanise the film. He therefore decided to avoid digital music and to use a "voice" to act as the emotional counterpart to the film, and after a chance meeting with cellist Yo-Yo Ma agreed that this voice should be that resonant voice of the cello. Everyone seems to have their own favourite among Glass's Qatsi soundtracks, but Naqoyqatsi has many attractive qualities to it. In addition to the sonorous qualities of the cello and its solo passages, the music is frequently both dynamic and dramatic and underpinned with percussion elements. The casual listener might on a first hearing conclude that the film music of Glass tends to evolve slowly and therefore acts as musical wallpaper to a movie. However closer inspection shows that Glass carefully crafts the music to the film's narrative or flow, and includes "hit points" of perfect synchronisation. (See "The Hours" for excellent examples of this technique.) On the Qatsi films, Glass was helped in this respect by Reggio who was willing to cut film sequences to the music to achieve this alignment. The musical connection to the previous soundtracks begins after a dark fanfare with the customary chanting of the title word Naqoyqatsi, whereupon a heartbeat and cello arpeggios introduce a chord sequence accompanying images of a now derelict but formerly majestic station. Images and music (including tubular bells) seem to evolve in different directions and this unsettling prelude is brought to a close when a repeat of the chanting and heartbeat sound heralds a rapid sequence of drums and brass chords bringing up the film's title, seemingly digitally encoded in red. In complete contrast to this dark mood, Primacy of Number shows the allure of the digital world when a Jew's Harp introduces an up-tempo beat accompanying a rapid stream of images showing many different aspects of modern technology from a potentially infinite zoom on the Mandlebrot Set to the first stock images of war. The music turns more concerned at the way events turn out and without losing pace a snare drum and brass build to a cresendo (still with occasional Jew's Harp) which settles on a cadence whose finishing C major chord still offers a degree of hope.